Track your Bonsai tree collection on your Windows PC – Coming Soon! 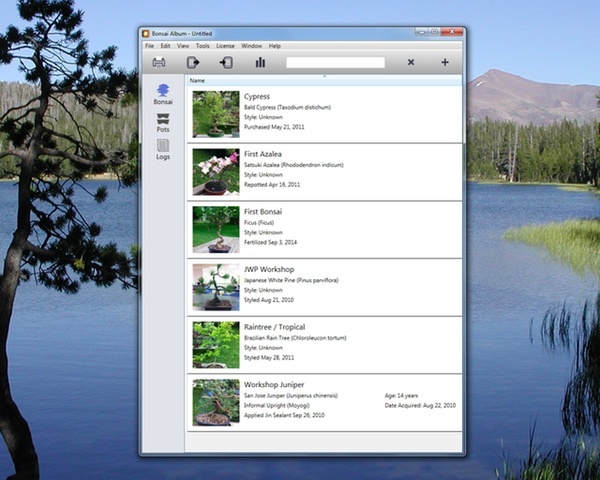 Some time ago I announced my plans to bring my popular iOS and Mac app, Bonsai Album, to the Windows platform. After months of false-starts and development struggles, I’m finally able to provide an early peek at the interface. You’ll note that it looks very similar to the Mac version. Under the surface though, the PC version is a total rewrite. I’ve had to learn a new programming language, and come to grips with the intricacies of development on an unfamiliar platform. In recent months I’ve made rapid progress, so I’m hoping this pace continues! The PC version will include much the same features as the Mac, including printing. enhanced search capabilities, and data transfer to and from the iOS version over WiFi. The app will be localized into multiple languages, including English, Japanese, French, Italian, German, Spanish, and Portuguese. I’m hoping to provide support for all these languages in the first version, but it may take longer than planned. Early on I wasn’t sure whether I’d be able to support Windows XP, but now it’s looking like XP support should be doable. The app will also support Windows Vista, 7, 8, and 8.1. I’m planning to release Bonsai Album for PC for direct sale via my website. It’ll be available for download as a free trial version, with similar limitations to the Lite iOS version. The full feature-set can be unlocked via purchase. I can’t promise an exact release date just yet, but I’m shooting for the first Beta version to be available by the end of 2014. If a PC version of Bonsai Album sounds interesting to you, and you’d like to Beta test or just be notified when the app is closer to launch, sign-up here. I’ll also be posting the occasional update on the Bonsai Album Facebook page.